Beautifully connect your home and garden with our exceptional Aluminium Patio Doors. Available to customers in Camberley, Ash Vale, Guildford, Farnborough and across Surrey, our aluminium sliding doors are an exquisite way to open up your property, bringing in an influx of light with the illusion of space. With Smarts Visoglide and Air Sliders500 LS and 600 LS to choose from, it’s easy to find the best aluminium sliding doors in Surrey for your property. For stunning aluminium patio doors that act perfectly as interior doors or exterior doors, choose Jewel Bi-Folds. There are many kinds of patio doors on the market, and it’s easy to become confused. Here at Jewel Bi-Folds we specialise in providing you with a friendly service that is as quick and simple as possible. We offer a range of aluminium patio doors to fit the needs of every Surrey home, including the likes of Smarts and Air Sliders. With a beautiful selection to offer, it’s easy to find the perfect patio doors for your home with Jewel Bi-Folds. For the very latest in style and practicality, look no further than our stunning Aluminium Patio Door range. Available in a range of finishes and powder coatings including an ever-popular wood effect, our Smarts Visoglide Aluminium Patio Sliding Doors can be beautifully customized to your specifications. Each profile contains 2 aluminium extrusions that are separated using polyamide strips with glass fibre, and are readily available in a choice of configurations to create the perfect sliding doors for you. You can be rest assured that these Aluminium Sliding Doors are both thermally efficient and sound-proof, giving your Surrey home the highest safety levels achievable. Featuring internal beading, you can be rest assured that your family’s safety is of the highest concern here at Jewel, with unbeatable security values included as standard. For the very latest in style and high performance, our Air Sliders Aluminium Sliding Patio Doors are perfect. Tested to the highest safety standards, our Air Sliders Aluminium Doors are accredited by Secured by Design, and are protected years into the future with a 25 year manufacturer’s guarantee. Keep the harsh effects of Mother Nature at bay with our beautiful Air Sliders, with exceptional weather proofing properties and only the best materials used to prevent colour fading, deteriorating or flaking. 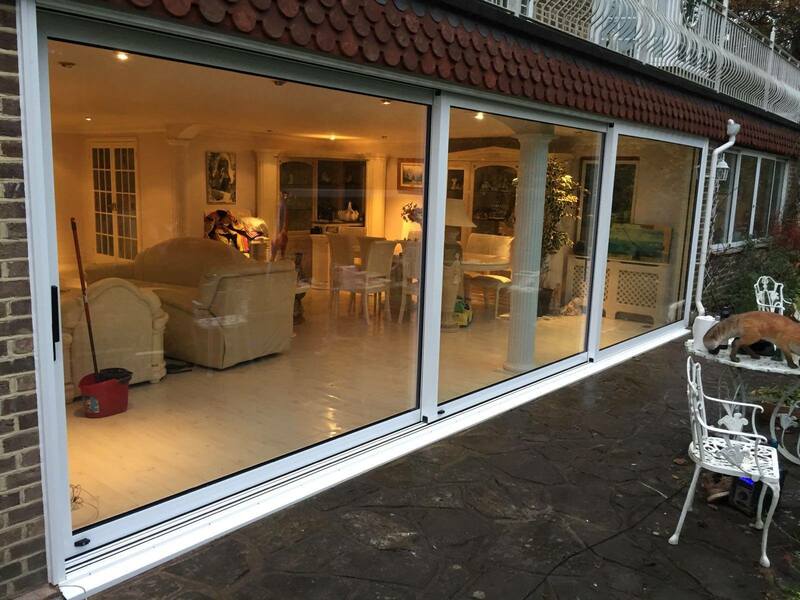 Our Aluminium Patio Sliding Doors accomplish incredibly low U values, keeping your Surrey home warmer for longer. They combine incredible strength and durability with exquisite functionality, through the slide mechanisms being light as a feather and easy to open and close. Call us today on 01252 444 365 for competitive Aluminium Patio Door prices – our helpful team are always happy to help you decide which doors are perfect for you and your Surrey home. If you would prefer to get in touch online, fill out our online contact form. You’ll be provided with a quick response that will help you choose the right patio door for you.